We must find a solution to healthcare, and everyone is presenting the same old model over and over again. Our president made many promises to be elected, but he seems incapable of offering a solution that can truly back up those promises. On February 27, 2011 the New York Times ran a story about the Obamas’ secret weapon for staying fit – a personal trainer that flies in weekly from Chicago. Are these people serious? Perhaps, it is something you would like to try, but I doubt that any of us have a cushion of US taxpayers’ money that would allow for such an insane expenditure. Needless to say, there is a huge cost to the environment (somewhere around 50,000 pounds of carbon emissions) when Mr. McClellan, the personal trainer, is flown back and forth to Washington. Check out a story ran today by the Washington Examiner that provides more on the hypocrisy on display when two leaders ask their followers to drive less and eat local food to reduce carbon emissions, but they fly a trainer across the country so they don’t have to sweat alone. 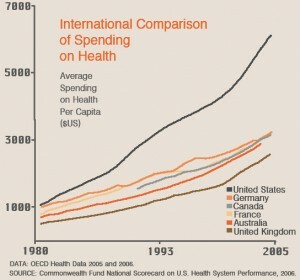 There is no solution to the healthcare spending crisis coming if we adopt the approach of our president. There are surely plenty of qualified trainers in the Washington D.C. area that the Obamas could employ, but apparently reducing carbon emissions and the deficit is what they are going to tell us to do without making any sacrifice their selves. The message of The Wellness Institute for Economic Growth is real, and it asks us to take it upon ourselves to make our country fit and competitive again. The only solution is to excel where our leaders are failing. That means we must “talk the talk” and “walk the walk”. If you haven’t figured it out by now, our government does not know how to provide a remedy. Our representatives and the health and fitness industry don’t necessarily have your interests in mind. They are both mostly concerned with growing or gaining power. When you fly someone across the country to count your repetitions while you train you do so to feel very powerful, not because there isn’t someone just as qualified in the same zip code. Also, when you accept this proposition as a trainer you are mostly concerned with yourself and growing your business – which is making people feel like they can’t stay fit without you. Besides, the New York Times wrote that this guy has been training the president for over a decade. If the trainer is just half-decent, shouldn’t the president know how to condition himself by now? The government is influenced by an assortment of lobbyists who would lose a lot of money if healthcare costs are ever truly controlled, and the health and fitness industry would have to undergo great change if they were to set you free to exercise on your own like the Wellness Institute for Economic Growth recommends. The Wellness Institute for Economic Growth continually empowers people by saying, “It does not have to be complicated. Eat a balanced diet and weave movement into your day.” Create an integrated exercise lifestyle. The solution can not and will not come from anyone else but the individual. The chart that accompanies this article shows us that we, as a country need to do something.